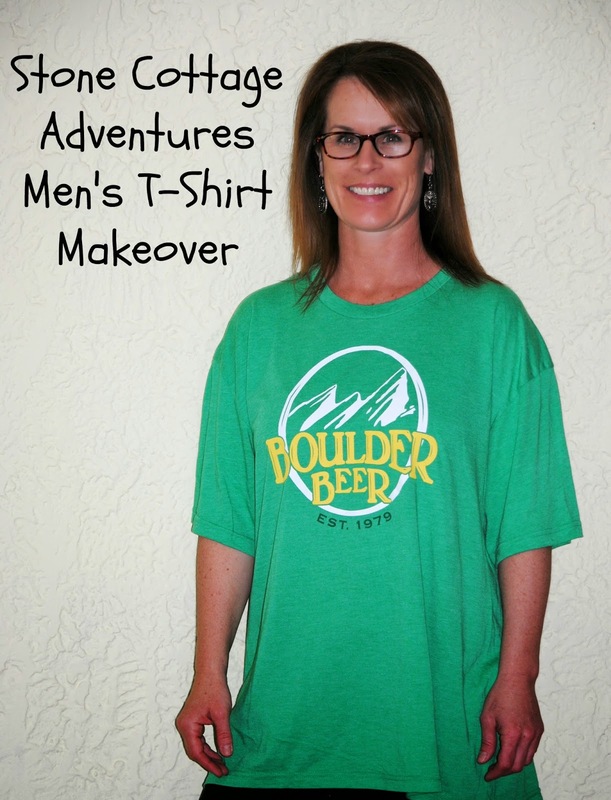 When we visited Colorado in April, Handsome Husband purchased this cool T-Shirt from Colorado's First Craft Brewery. Did he try it on before the purchase? Well, of course not! ;-) When we get home, it doesn't fit him. 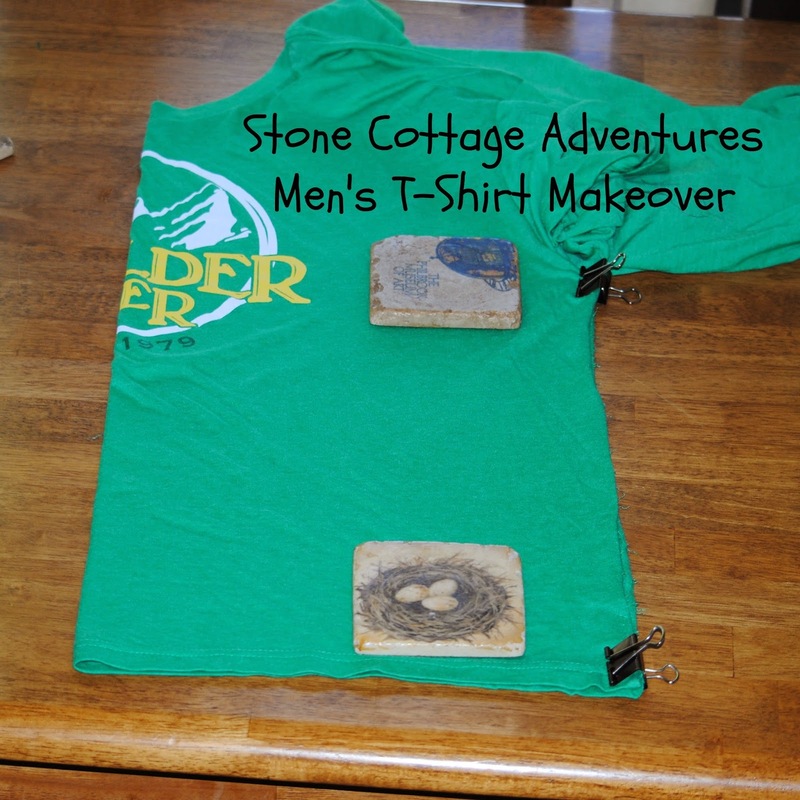 Ya'll know how I love T-Shirt makeovers! Click HERE to see some of them! 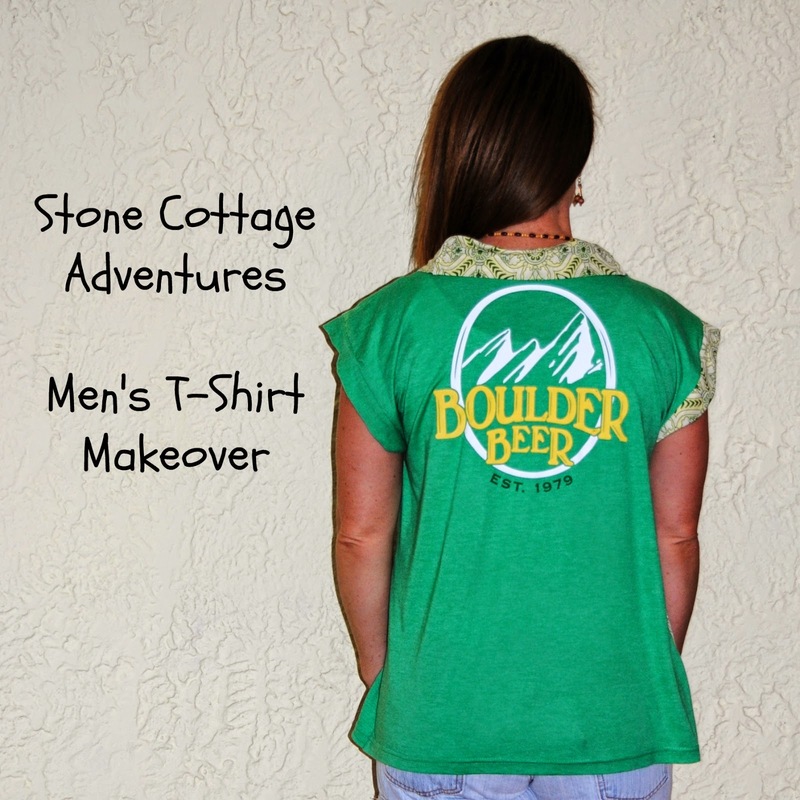 This one is a wonderful lightweight T, perfect for Summer, and I love the logo! What a great color scheme! 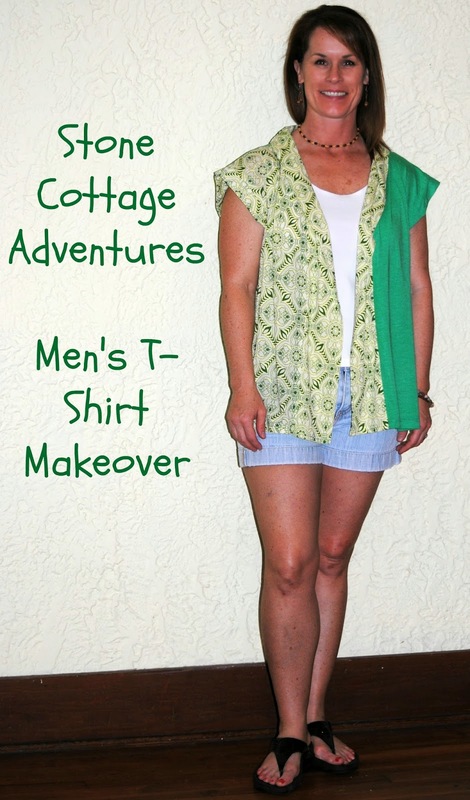 One look at The Ojai Wrap pattern and I knew what this T would become! A sweet little cardigan! The project began by carefully taking out the side seams. Next the T was folded in half at the logo and laid as flat as possible. I cut the back for the cardigan from the front of the T and one front panel from the back of the T.
Here's a tip for folks new to sewing. Don't feel like you have to purchase the latest, greatest gadgets. Instead of using fancy sewing weights, my regular ol' ceramic coasters work just fine. Pins? No, thanks! They bite! I prefer the paper clips pictured above. What are those clippy things called? I'm just not sure. Back to the makeover... What do you think? Some fabric had to be supplemented. I found a half yard of fun lightweight knit at my local Hancock's and cranked out this Ojai Wrap! In all honesty, since the T wasn't long enough to make the fun high low hem, I struggled a little figuring out how to make the other side the correct length. For the shawl collar, I cut the one for size Small, sewed from the bottom to the shoulder seam on each side, then sort of pieced it together at the back. If you have questions about that, just email me! My favorite part? The back! I love that it has a patchwork feel to it, too! Have you ever been at the river all day? Ya know that part of the day when the sun starts hurting your shoulders? Wouldn't this T-Shirt Cardigan be the perfect thing to wear? ;-) I'm also seeing it on sunset walks as the breeze cools. My new summertime, going-to-the-river and walking-at-sunset outfit! Let's do the before and after thing. 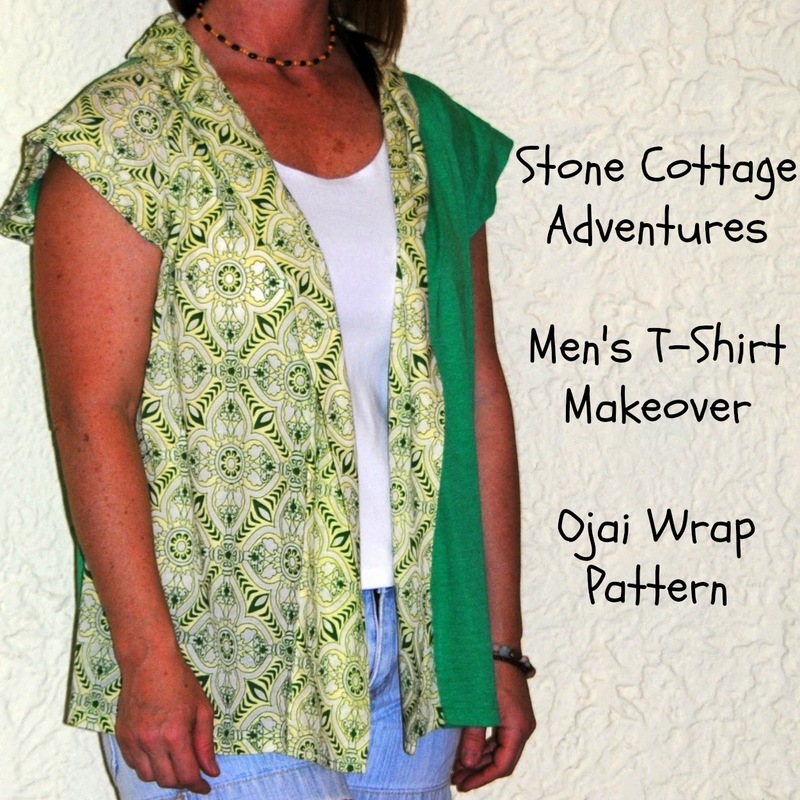 If you would like to see my first Ojai Wrap pattern review, click HERE. That one is a much dressier version. There is a third Ojai Wrap coming your way next week! Come back and see me! I LOVE this idea! Super cool that you were able to keep the logo on the back. AWESOME! have a great weekend! What a GREAT idea!! Again you look super cute in it too ! I will for sure have to try this when I wrap up my other projects. That's such a good idea and it looks great. Imagine how awesome it would look if you had gone to Mountain Sun! they've got really great t-shirts! and awesome craft beer! have a great weekend. Linking up from the Weekday Mixer Social media linkup. fun and fab upcycle!! Now if I can just find a nice shirt of hubbies he is willing to give up! Cute idea, thanks for sharing it with us at the #WWDParty - have a wonderful weekend. The green colour really suits you, Marci. A great refashion and another fab Ojai. I wouldn't have been game to supplement with the 2nd fabric, but it works so well!!! I call those clips bulldog clips. I've featured your Ojai today, Marci. It is very creative of you to present alter your t-shirt this way. Thanks for sharing with 4 seasons blog hop. Cheers and have a nice day.